Do you know a true business professional? Been impressed by a dedicated professional you work with? Have a true go-getter in your office? 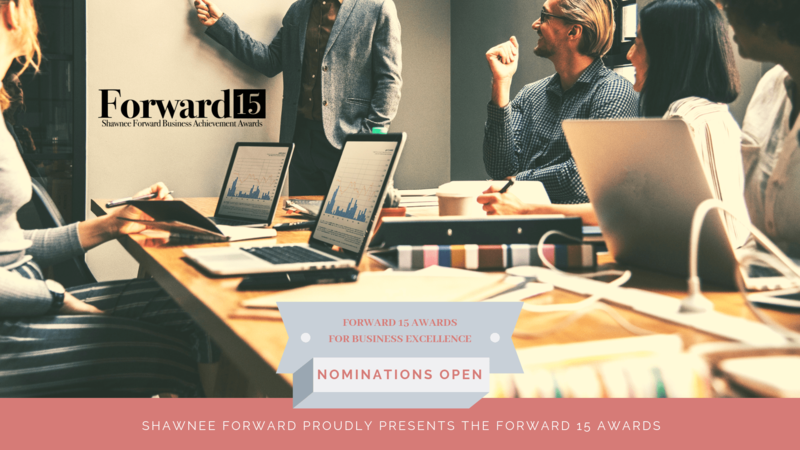 Nominate them for the Forward 15 Business Achievement Awards! It is affirmation that their hard work is getting noticed – and a career-boosting professional achievement as well. The Forward 15 Business Achievement Awards celebrate the achievements of professionals in the Shawnee region — movers and shakers who exemplify true excellence in their careers and who bring a strong voice and commitment to our region. Online nominations are now open and those chosen will be honored at our Forward 15 Awards presentation at the annual banquet at The Heart of Oklahoma Expo Center in June. The deadline for nominations is March 22, 2019. WHEN WILL SHAWNEE FORWARD ANNOUNCE THE 2019 FORWARD 15 CLASS? The Forward 15 winners are announced at the annual banquet in June. Nominations open February 1, 2019. The deadline for submissions is March 22, 2019. WHAT ARE THE QUALIFICATIONS FOR FORWARD 15? We are looking for those who are making an indelible impact in our community. We also are interested in those who exemplify true excellence in their careers and who bring a strong voice and commitment to their profession and the community at large. Strong business leadership and community service, as well as participation in trade groups, will be considered. WHO DECIDES WHO WILL BE IN THE FORWARD 15? A Third-Party group made up of business professionals who live outside our area will determine our winners. CAN I JUST CALL YOU OR SEND YOU AN E-MAIL WITH THE NAME OF THE PERSON I’D LIKE TO NOMINATE? No. We need to have the nomination form filled out, including contact information for the person you are nominating. A Nomination Fee, a Nomination Letter as well as the nominee’s resume or Linked In profile is also required. I WANT TO NOMINATE SOMEONE, BUT CAN I REMAIN ANONYMOUS? No, we need to know who you are, though we do not share nominator information. I WANT TO NOMINATE MY BOSS BUT WOULD IT BE BETTER IF SOMEONE HIGHER UP NOMINATED HIM? CAN I NOMINATE A FAMILY MEMBER? Nominator must be a senior leader or manager in a Shawnee Forward Member organization. All nominations should provide clear, business-oriented reasons for the nomination, regardless of the relationship between nominator and nominee. No. In fact, evidence of an organized campaign to send many nominations is viewed negatively. Yes, all qualifying nominations will be accepted. After we receive a nomination, candidates will be vetted. Shawnee Forward’s third-party panel of judges will hold a series of meetings to determine which candidates will be chosen. We aspire to come up with a diverse list that represents a broad spectrum of our community. Candidates who are selected must provide a photo and profile. Selectee’s attendance at the ceremony is encouraged. No. We will not provide status reports. Should we need any additional information, we will contact the nominee or nominator. I WAS NOT PICKED FOR FORWARD 15. CAN YOU TELL ME WHY? With just 15 slots and a large volume of nominees, many nominees will not be chosen. Nomination itself is a form of recognition and an honor. We encourage nominators to re-nominate the following year if their candidate was not chosen.